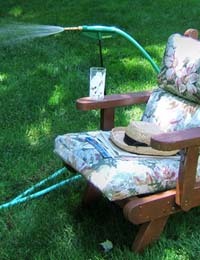 Hoster: Hands-free watering system [Hoster] - $15.00 : NewDaVincis.com!, Great Innovative Products, Gadgets and more. The Hoster is a revolutionary take on gardening. 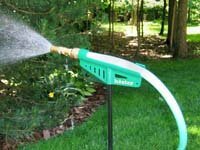 Hands-free watering system: hoster is a timesaving invention for watering a specific area of lawn or garden and then allows a user to walk away and do other activities while the lawn or garden is being watered. The total system consists of two components: a steel post and the hoster. Easy to operate: Just snap a garden hose into the hoster retaining clamps, aim the nozzle at the area to be watered and lower the device unto the steel post, and don?t forget to turn the water on. When ready to water a new area, just lift the device from the post, re-aim the nozzle either left or right, then lower the device onto the post. You don?t even have to turn the water off. Easy repositioning during operation: Either by repositioning the hoster onto the steel post or by lifting the steel post, along with the attached hoster device still mounted on the post, and moving the post and hoster to a new area to be watered. Vertical and horizontal direction of water spray easily accomplished: vertically by means of the upward and downward angles of the hoster trough and horizontally by means of the unique ratcheted coupling that mounts the hoster onto the post. Durable construction: One-piece molded plastic material will withstand harsh sun and weather conditions. Ergonomic appearance: Green coloring allows blending with environment and the plastic construction will not harm surrounding plantings. Not dependent on flat surface to operate: Since the steel post is pushed into the ground, it is not necessary to have a flat surface on which to operate successfully. Saves water: by directing the water spray or stream to a specific area and thereby not watering unnecessary areas such as sidewalks or buildings. 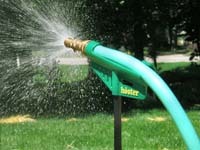 Use hoster as a toy for your children to run through while you water your lawn. Keep your children's water slide wet for a nice smooth slide. Impress neighbors with a unique device in your front lawn.